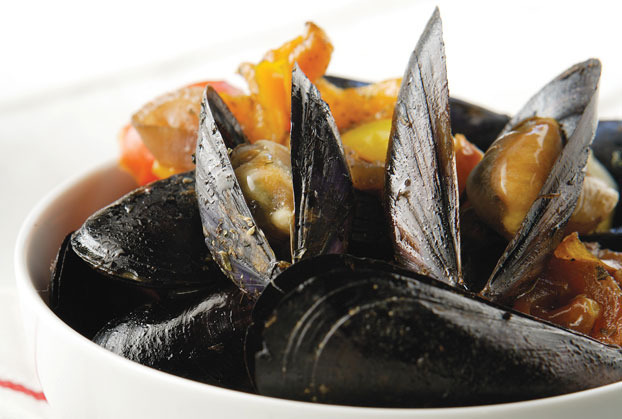 Discard those mussels which remain open even if you put them on a hard work surface and tap them sharply in order to close up. Wash the closed mussels in cold water and scrub any dirty shells lightly with a scrubbing brush, pulling off any beardy beats you might find on them. Place the washed mussels in a bowl. In a deep casserole-type pan with a tight-fitting lid put the tomato slices and the onions and peppers rings. Add the chilli, garlic, balsamic vinegar, oregano and olive oil. Then add the mussels and shake the pan vigorously. Cover the pan and let the mussels cook on full whack only for 5 minutes. There is no need to add extra water.